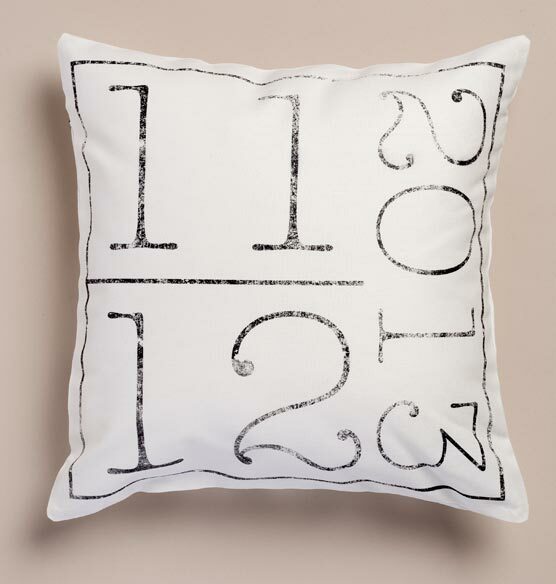 Celebrate a special date with this classic linen pillow, custom designed exclusively for Exposures. Bold and graphical, date pillow turns a significant milestone in your life, like a wedding or birthday, into eye-catching functional décor. 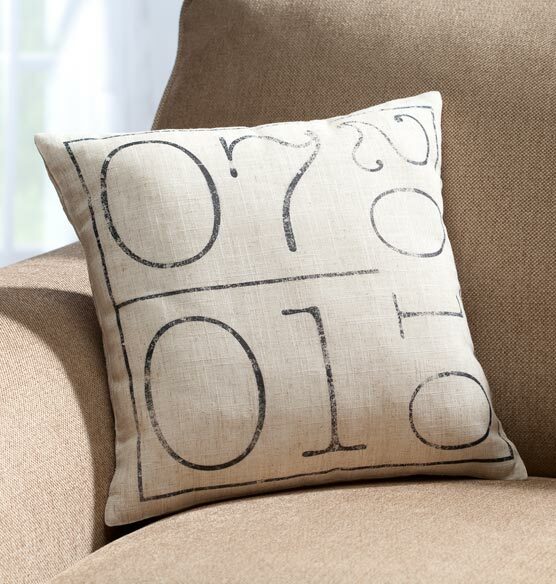 These pillows make nice, stylish accents that have a special meaning with dates to commemorate special moments. They match modern and traditional decor. I gave three of these this year as wedding/shower gifts and am now ordering my fourth. Everyone that received them has ooohed and ahhhhed over them. They felt good to the touch when I wrapped them. They weren't flimsy or thin. It's unique enough for the couple that has everything and yet it's a useful product. I give these as wedding gifts or anniversary gifts. Everyone who has received one has loved the graphic quality of the pillows and the useful way it marked an important occasion. Unique and lovely. This was a gift for grandson's birthday. The date of his birth on the pillow in a simplistic pattern was perfect for this young architect's apartment, and yet stated that he was special to us. Thinking of getting one for his fiancé's birthday also. My daughter received this pillow as a cool and special wedding gift 9 months ago, very thick and fluffy. I also ordered this pillow to give as a gift 7 months ago. That pillow was also thick and fluffy. I ordered and just received 3 of these pillows and the quality has gone down. The pillows are now thin and not so nice to give as a gift...kinda dinky looking. Please bring back the previous pillow form. Unfortunately, this cute pillow was stuffed with a cheap feeling, flat and lumpy filler. Once I replaced it with a down insert, I felt good about giving it as a gift. If you buy this overpriced, very small pillow, be prepared to spend more money to get a down filler, which helps boosts the quality/looks/feel. This is my second order for this item. I ordered it for my first grandchild with his birth date. The one i ordered today is for the second grandchild with his birth date. Will be a wonderful engagement present. As time passes you don't always remember the date you got engaged! Have given these blocks to a lot of friends and they love it! An Architect friend and his wife are celebrating their 50th wedding anniversary, this summer. I feel that this simple but personal pillow will look great in their home. Stylish, modern, and personalized for the couples big day! Great look and design. Marks the day simply! I thought it was nice! I wanted to commemorate a special wedding date. I have bought three of these over the past year for wedding or shower gifts and the recipients have loved them. It's uniquely theirs. Nice size and quality. part of a wedding present, and I hope they like it. Great way to commemorate my daughter's wedding! Unique product and good price. I have purchased 3 pf these as part of wedding gifts with the date of their wedding! What a wonderful reminder of their anniversary. Pillow covers are are very classy and the neutral cover goes with everything! This is the 2nd one I've purchased, very happy w/ product. Very classic look to display an important date in time. It was a unique way to celebrate a wedding anniversary! For a favorite grandson's birthday. If it's nice, will order one for his fiancÃ©'s b/d and another for their wedding date. I ordered one for myself about two years ago and have had many compliments. This is for my sister for her 80th birthday. She will love it. Saw in USAir Magazine and loved the personalized touch! Looks like a great pillow to remember your special day. I think this is a unique and functional way to display a special date. Pertinent and Pretty, and functional! can the custom numbers be in navy? BEST ANSWER: Thank you for your question. No, this item is only offered with black printing. We hope this information will be of help to you. does the pillow still have the visible tag on the back that looks as if it's been cut? BEST ANSWER: Thank you for your question. Unfortunately, we were unable to determine what is was you are inquiring about. Please contact us at csr@exposuresonline.com with more detail as to how we may be of help to you. We hope this information will be of help to you. Yes. It is cut almost to the seam but visible. what is the size of this pillow? BEST ANSWER: I bought these as gifts, so I don't have one here to check. According to the catalog, they are 14 x 14. Kerry M.
Thank you for your question. The pillow measures 14 x 14. We hope this information will be of help to you. Next time you can check under the Specifications Label for measurements - pillows are 14" x 14"
14x14 ...very cute and well made. BEST ANSWER: Thank you for your question. The Your Special Date Pillow is designed to be spot cleaned. We hope this information will be of help to you. It can just be spot cleaned, there is no zipper to take the cover off. Have you returned to the original quality pillow that buyers reviewed so highly or will I receive the lower quality version if I order this? BEST ANSWER: Thank you for your question. The pillow is a high quality product that will work well for you. We hope this information will be of help to you. If I order today, could I get it by Sat. 4/11? BEST ANSWER: Thank you for your question. Our standard shipping is 5-7 business days and we ask that you add an extra 2-3 days for the personalized items. We hope this information will be of help to you.